Can be worked in both directions without the stitches shifting halfway. This could make it good for lace and other situations where that jog can be visible, as with bulky yarn or colorwork. It makes a decorative line of holes. If you’re familiar with long tail cast-on, it should be fairly straightforward. A further discovery: the cast-on row has no right or wrong side. You can dive straight into lace, if desired. I wouldn’t recommend it to someone who isn’t already familiar with long tail cast-on, as it’s a bit fiddly, and knowledge of long tail will help. Visible holes are required to make the flip-flop cast-on reasonably stretchy. These can be filled in with surface crochet or chain stitch embroidery if desired, though that makes it less stretchy. It makes a lot of extra ends to work in. These images illustrate the concept I had in mind. Then I had to figure out how to accomplish it. First, cut two lengths of either the same yarn or contrasting yarn. This will be part of the finished knitting, so waste yarn isn’t in order. (Unless you’re just swatching and want to use contrasting yarn to see what you’re doing.) I don’t know for certain yet how long they should be, because my swatch was sized based on the length of yarn I cut. I would guess that each of the two lengths should be 2 – 2.5 times the width of the final knitting, plus a bit for the end at each side. Hold together one end from each of these lengths and also the end of your working yarn. (Three ends total.) Make a slip knot in them all together and put it on your needle. This will be undone later. 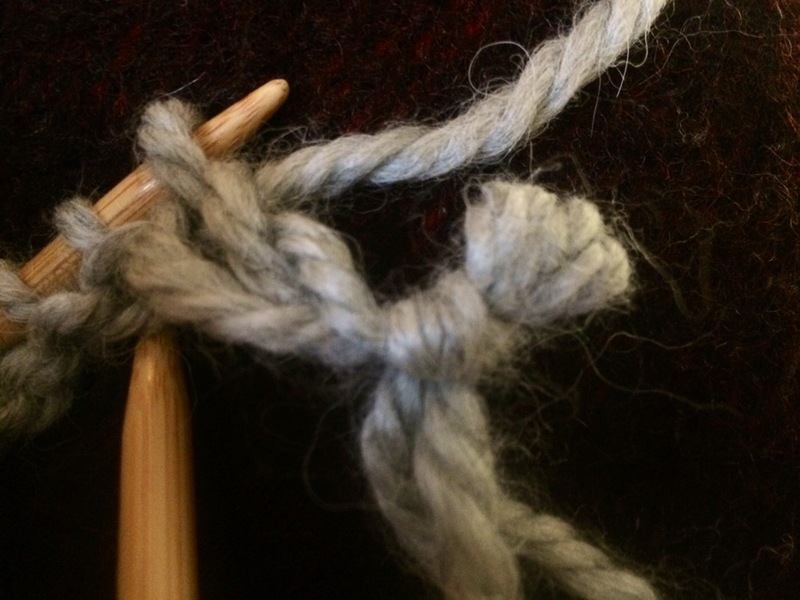 Hold the two lengths gently in your left hand, with the working yarn held over your index finger. Place your thumb to keep the two lengths slightly separate. 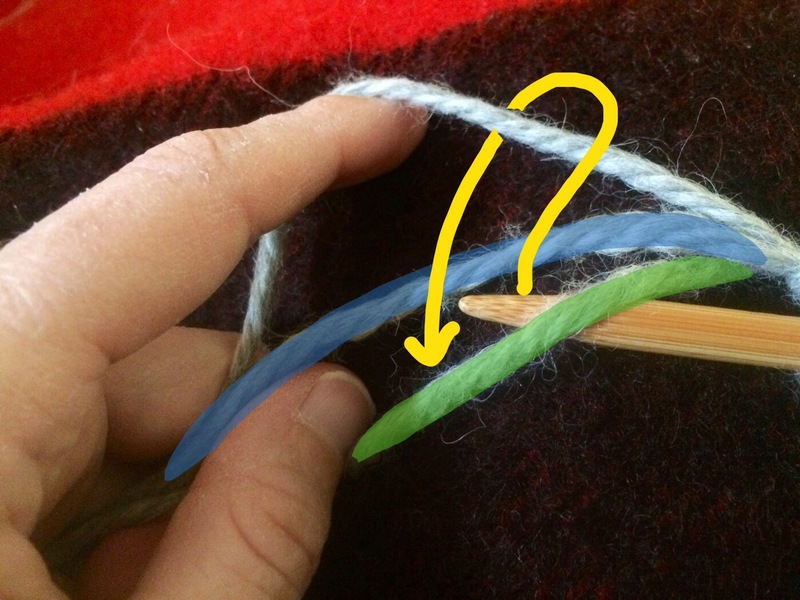 Put your needle under the bottom strand (highlighted here in green). 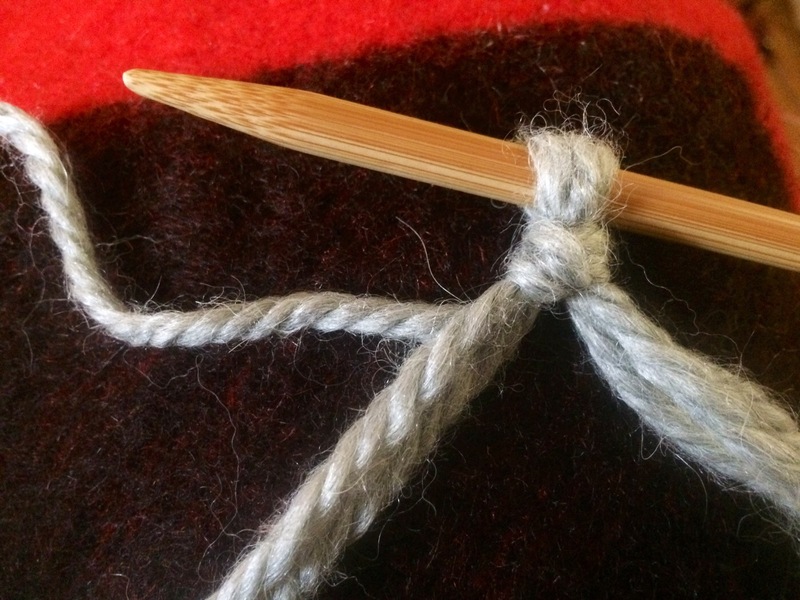 Pretend it’s a stitch, and make a new stitch from it with the working yarn: bring the needle forward between the two parallel strands, move it up, and pick up the working yarn. Then pull the working yarn down between the two parallel strands. Next, put your needle between the two parallel strands, from front to back. That is, you’ll pick up the middle strand (highlighted here in blue). Then knit a stitch. Do not pull it tight. Repeat steps 1 & 2 until there are enough stitches on the needle, not counting the slip knot. Important note: The key to this cast-on being stretchy enough is that the stitches should be stretched along the needle with large gaps in between as you go. Once there are enough stitches on the needle, tie a slip knot in the ends of the two parallel strands, leaving the working yarn free. 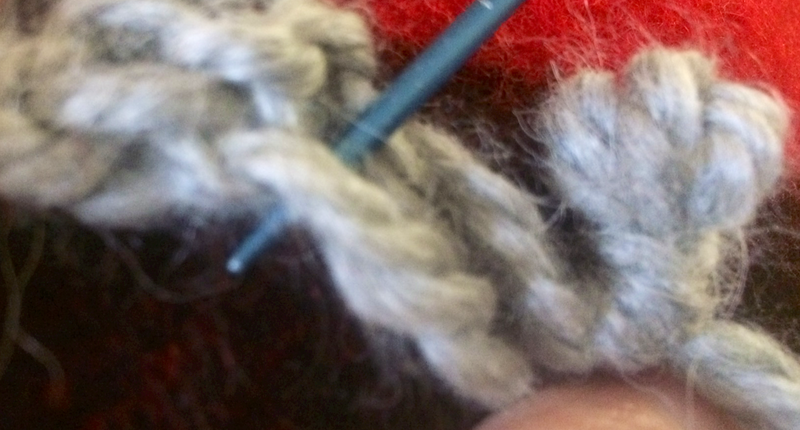 Work across a wrong side row, dropping the slip knot made from three yarns from the needle when you reach it. Just leave it hanging from the knitting for now; it will keep the ends under control. Each stitch is picked up from top to bottom. If possible, I recommend using a much smaller needle to make it easier to pick up the stitches. Here’s the second stitch being picked up. 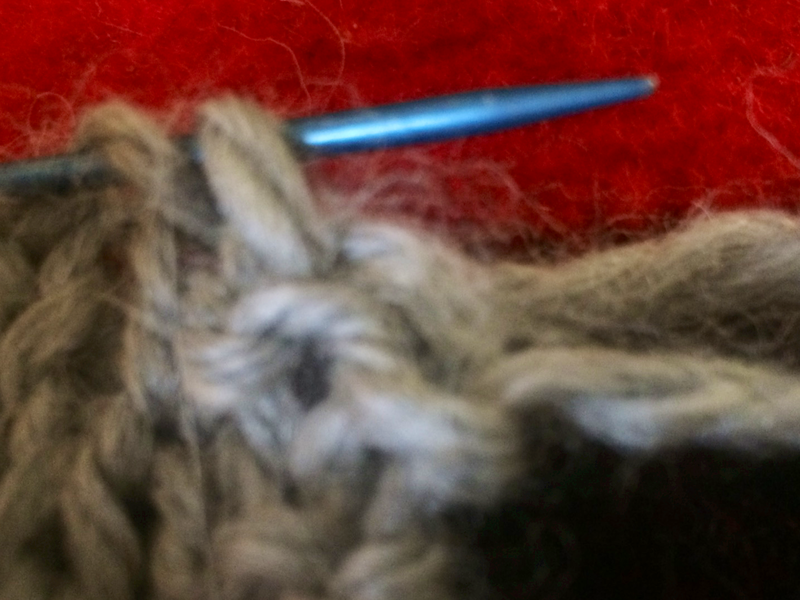 The last stitch was hard for me to find; I ended up tugging gently on each of the ends on that side to find it. I don’t have a photo that shows it on the needle. Now knit one right side row across, with the proper needle size, and continue as before. Here’s the end result of my swatch. Notice that the strands of what was the bottom yarn of the parallel strands are more visible because they always cross in front. 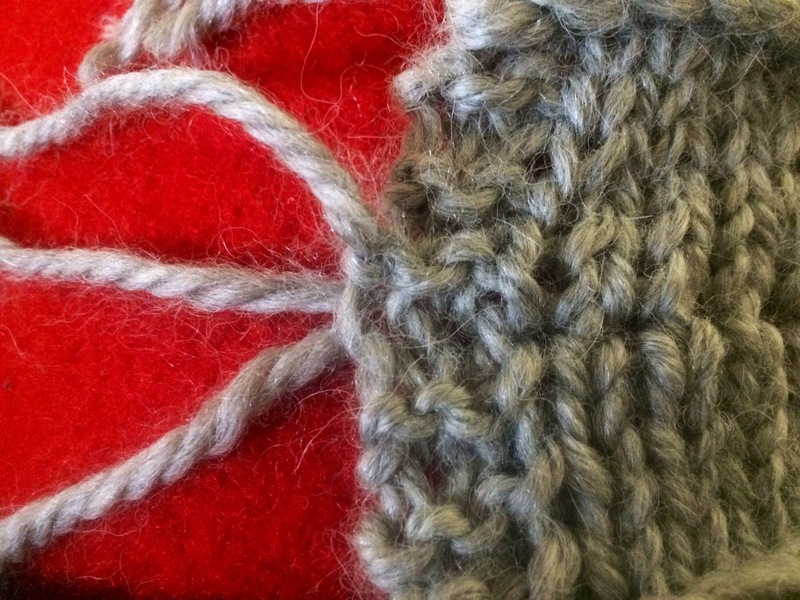 With the first half of the knitting at the top, undo the slip knot at the right. 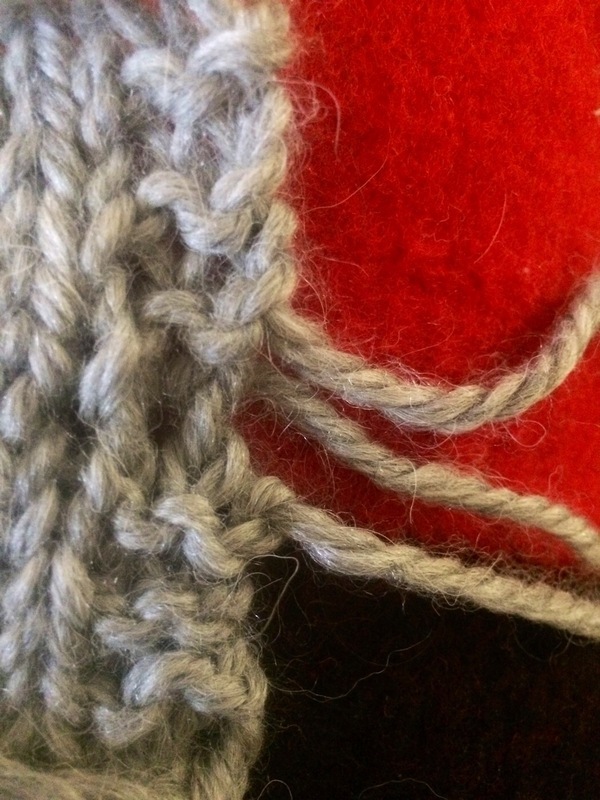 The top strand is the tail of the working yarn; it can be worked into the top half of the knitting. 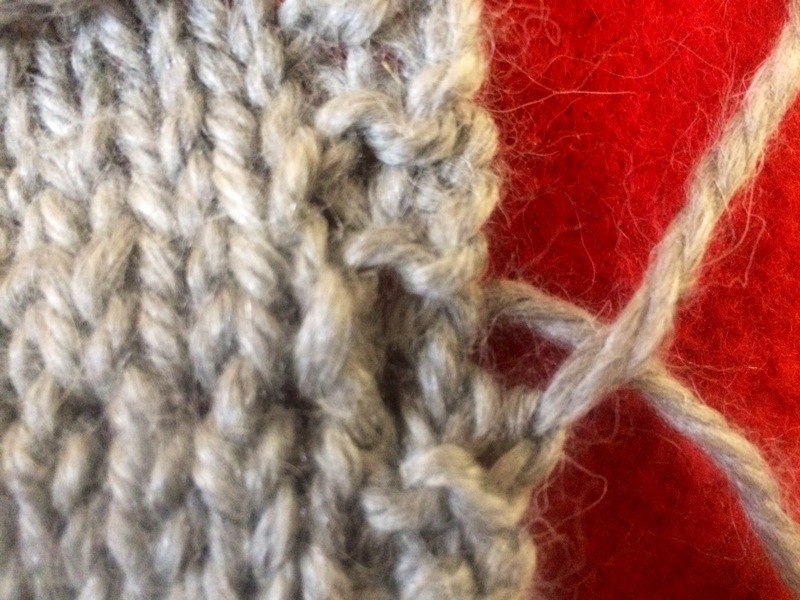 To complete the crossed loop structure and hold the stitch at each end well, these two ends should be crossed: what was the bottom end should be worked into the top half of the knitting; what was the top end should be worked into the bottom half. Undo the slip knot at the other side. This edge is much more stable; work in the ends where it seems good to you.